A stone-cold cauldron squats between the Shira Ridge and the blowhole of Kibo. Erosion has worn away the rim facing Kenya. Gravity claws at the escarpment dropping into greater Tanzania. Between these features is the Shira Plateau, a classic example of a volcanic caldera. I try to imagine the forces that shaped it. Map courtesy of Google Earth. Note the cone in the center of Shira's ancient caldera. Some call it Platz Peak. I'm glad this cauldron is stone-cold. I wouldn't want to have been anywhere in East Africa when it was sizzling! Trekking across the caldera known as the Shira Plateau. Our noses are pointed to Kibo. Photo by teammember Nico Roger. We point our noses at Kibo and set out in single file. Our goal? The far side of the Shira where Moir Hut Camp nestles at 13,800 feet. The plateau before us appeared nondescript, an alpine plain forged in fire, but now swathed in grasses warmed by the sun. A closer look at its history, disposition, and flora reveals other interesting details. The first European to climb Kilimanjaro was the German Hans Meyer. On his fourth expedition of 1898, he and his companion, Ernst Platz, descended Kibo's western side. They entered the Shira and spent some time there, exploring, note-taking, and mapping. The eruption cone of the caldera was noted (check back to our comments here) and dubbed Platzkegal by Meyer after his companion (see "Platz Peak" in the map above). According to the lore, the name of Platz was subsequently lost when Plazkegal was inadvertently translated by the British as "Place Cone" or "Cone Place." One still finds it listed this way here and there. The rise on the horizon marks the caldera rim. Here the Shira Cathedral (or Dome) rises in the center of the picture. The narrow point to the right is the Shira Needle. Still further right and off camera is the Platzkegal. 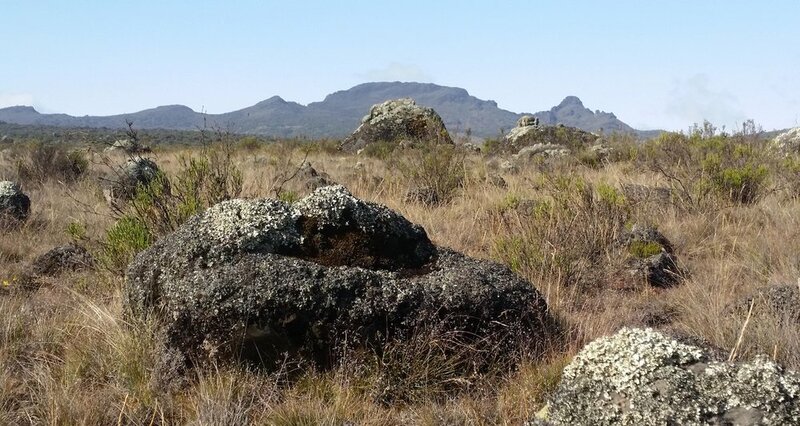 Nearer to the camera are huge igneous boulders covered in lichen. Our route did not take us near the Platzkegal, but from the trail we could see it, along with the 800 foot rise that marks the south rim of the caldera. Our guides identified familiar landmarks including Platz Peak, the Shira Cathedral, and the Shira Needle. Platz illustrates a bad day in his "Durchbruch einer Schneewächte" (1897). Image found here. No severe challenges face the Shira trekker. Nonetheless, the terrain has surprising texture. The Shira surface is corrugated, a situation resulting from lava flows and from the melt-water runoff that continues to groove it. The Ngare Nairobi (Maasai for "cold river") is the chief of these. Its gathering fingers are spread across the plain. These are crossed on several occasions. The surface of the Shira was laid down as lava. It has a hard and evenly-weathered appearance. On the west side is it dominated by trachydolerite from Shira; on the east, the rarer rhombporphyry of Kibo. In this shot, our Kandoo team navigates a watercourse. Photo by teammember Nico Roger. To survive in this alpine context, flora must be resilient. Grasses, shrubs, and heath dominate. "Everlastings" (Helichrysum newii) provide exotic color to an otherwise drab landscape. Likewise, delicate blooms of (what I hope is) Queen's Crown (Rhodiola rhodantha) fight for life in the gravelly surface of the Shira. 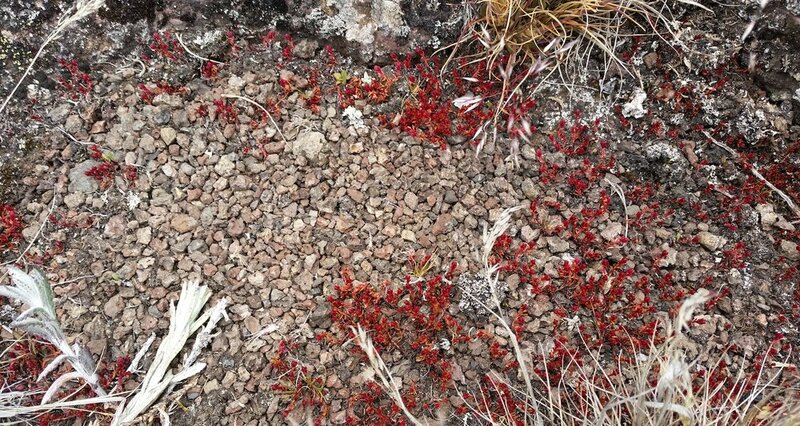 Varieties of "Everlastings" follow us up the mountain. By the end of the day the clouds began to conspire against us. Robert, ever savvy, stopped and instructed us to to brace for weather. We donned raingear. Those who had covers for their packs put them on. Then, as if on command, the precipitation came down. It rained. It snowed. It hailed. The wind blew. It rained some more. We hugged a cliff face and felt properly welcomed to Kibo's heights. Moir Hut Camp was just ahead. Our ascent to Moir Hut Camp was a wet one. Photo by teammember Nico Roger.